ARE we all getting older and so have collectively more time to go off and smell the flowers? Or are we just becoming more interested in the flowers in not just our own gardens, but those in public places often hundreds – even thousands – of kilometres away with their increasingly exquisite and imaginative creations on annual display? Whatever, the folk of the Southern Highlands of NSW, based on picturesque Bowral, Mittagong and Moss Vale, and a dozen or so enchanting surrounding villages and hamlets just 1.5hrs south of Sydney, certainly knew how to play the game with their 58th Annual Tulip Time Festival over the recent Labour Day Long Weekend. For not only did they entice some 14,500 visitors to their Long Weekend Tulip Time based on Bowral’s famed Corbett Gardens with its kaleidoscopic 75,000 tulips and 15,000 annuals, but an all-time record 48,000 garden buffs came to enjoy these blooms over the fortnight embracing Tulip Time, and to see more than 40,000 other tulips planted across the Highlands. And to enjoy the Southern Highlands Annual Food and Wine Festival held at the same time. According to Steve Rosa, Manager of local tourism body Destination Southern Highlands, those 48,000 visitors were not only the most ever for Tulip Time, they were a whopping 14,000 more than for Tulip Time 2017. And they came from not only across NSW and by coach from as far afield as Melbourne, Brisbane and Queensland’s Sunshine Coast… but, Mr Rosa said, some even came from as far off as India, China and Korea as part of visits to Australia. And he says the Southern Highlands are hoping for bigger numbers next year, with Tulip Time from September 24 to October 7 2019. 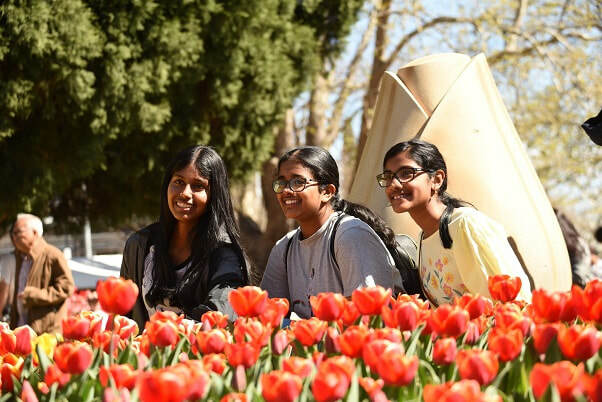 BOWRAL’S Corbett Gardens were the focal point for the Southern Highlands’ famed Tulip Time Festival that was held over the recent Labour Day Long Weekend, and will entice thousands of visitors once more when it’s on again in September 2019. VISITORS came from not only across NSW, the ACT, Victoria and Queensland, but even internationally, including from India, China and Korea.